Before the turn of the century, Athens Junction was a whistle stop on the New York Central Railroad. Soon after "Will" Carman opened his general store at the crossing, the junction became "Carman's," an official train stop whose name was eventually shortened to Carman. In time, the name Carman applied to most of that area of Rotterdam now protected by the Carman Fire Department. In the early 1900's, most of Carman was farmland. The section now called Coldbrook was the densely wooded James Estate. Highbridge Manor, Fred's Community Plot, Stoodley Gardens, and Stonegate Manor, as well as most of our other residential streets, did not yet exist. The bulk of the people lived on the north (Schenectady) side of the railroad tracks. The Carman Fire Department, as we know it, was formally organized in 1933. However, it did have an earlier version. The real beginnings were back in 1910, when a fire brigade was started by five men: Anthony Blayzor, his son Anthony, Jr., Emmett Fisher, Joseph Fisher, and Andrew Stahl. Their meeting place was in Dowling (later called Felix) Hall. Equipment consisted of a few scaling ladders and water pails. About all that those early firefighters could really do was to set up a bucket brigade and try to keep the blaze from spreading. There are still some older Carman residents who remember the fire gong in front of McGroty's Tavern at the north side of the railroad crossing. The railroad donated a steel tire from an engine drive wheel and it was hung from a wooden frame. When whacked with a sledge, that gong could be heard a full mile. Anthony Blayzor bought Will Carman's store and was both storekeeper and postmaster until World War I started. After the war, the fledgling fire department moved to Lander's & VanPatten's barn, which is still standing on First Street. A few of the other members of the department at that time were Claude Posson, Whittmore Hunt, Edward Gillespie and Arthur Knight. Their sledge activated alarm system operated on a large rail hung near the firehouse. The present Carman Fire Department originated in the home of Joseph Reisinger, in 1933, on Second Avenue. Better fire protection was frequently discussed during the weekly card games. Six of the players formally organized the Department. They were George Fry, James Hallenbeck, Whittmore Hunt, Edward Lenigar, Joseph Reisinger and George Reisinger. The first official Department meeting was held at the home of William Lenigar on Hamburg Street. The full complement for the newly organized Department was twenty-three active men. Fred Stay was elected the first Chief. The fire district had an assessed valuation of $685,975. Three weeks after the Department was organized, the first emergency occurred. The Smiley and Cochrane Homes, on Campbell Road, caught fire. Unfortunately, due to the very high winds, the bucket brigade could not save the homes. However, most of the furniture was saved. Both homes were subsequently rebuilt. Dances, card parties and benefits were held to raise money to pay for the first piece of apparatus. It was a 1916 Mack Truck, which came from the Stanford Heights Fire Department. The truck had hard rubber tires, which made it hard to handle on dirt roads. Those first years were certainly trying for the new Department. What the men lacked in equipment, they made up with in determination. Imagine the frustration of the driver as that first truck coughed and wheezed its way to a fire with kids on bicycles racing it and the kids winning! The Ladies Auxiliary of the Carman Fire Department was formed shortly after. Its purpose was to help raise money and to provide refreshments at fire scenes. In the early 1930's, the fire insurance rates for the district were very high. There were no hydrants. In an attempt to decrease the rates, a second station house was planned. In 1935, a cement block building was constructed at the intersection of East Campbell Road and William Street. A Packard roadster squad truck was rebuilt as a fire truck and moved into the new building. The rebuilt Packard roadster was originally bought for the rescue squad, then called the Dare Devil Squad. The squad took part in many Firemanic competitions with other departments, taking many prizes and cups, some still on display in today's fire station. That group was also one of the roots of the present ambulance service, the Rotterdam Emergency Medical Service (REMS). A used Cadillac was then put in service as a rescue car. After the East Campbell Road firehouse was built, a larger company of men was formed and a more extensive assortment of fire fighting equipment was purchased. Funds were provided mainly through the money raising efforts of the members of the Department and the Ladies Auxiliary. Many dances, food sales and card parties were held. After the second fire company was stationed on East Campbell Road, several members began to organize their own fire department in that area. However, that idea was abandoned and subsequently, the second company was disbanded, and the equipment returned to the First Street station. In 1937, a generous neighbor, Mrs. Anna LaFleshe, donated the money needed to buy a 1936 Dodge truck chassis from Burtiss Motors. The members then transferred the body of the 1916 Mack truck to the new Dodge. The Fire Police organization was begun in 1937. Those men were given the duties of directing traffic at emergencies as well as maintaining fire lines. A brand new Dodge fire truck, a Sanford, was bought in 1940. That was an important event in the Department's history. The Sanford was a sight to behold and gave faithful service for nearly thirty years. World War II brought many changes to the Department. Many of the members entered the Armed Services. A shortage of trained firefighting people resulted, Chief Joe Reisinger organized a Junior Fire Fighters group, made up of younger people who helped fight grass and other small fires. At times, the Ladies Auxiliary also turned out to help. During those war years, men were stationed at the firehouse on First Street, sleeping there on cots. A patriotic letter was sent to the Defense Council in Washington, which said that this Department, even though small, was ready and on the alert for all emergencies. A letter of recognition was received from President Roosevelt, thanking the men of the Company. The Department grew and thrived, thanks to the hard work of the members and the Ladies Auxiliary during the War years. After the War, a surplus Army fire truck was purchased from the Army Depot. Immediately after the War, the pressures of growth hit Carman. It became apparent that a new firehouse was needed. Many dances were held at Felix Hall and the proceeds were saved to buy the needed land. The Hamburg Street property was purchased from the Cooper Estate. The present firehouse stands on part of the old Cooper farm. Plans were made for the new fire station building, on Hamburg Street, by the Board of Fire Commissioners, who were: John Wickham (Chairman), Harry Bayliss, Chester Perkins, Stephen Sebis and George Reisinger. Construction was started in 1947 and completed at a cost of $45,000. The new Firehouse was officially dedicated with a week-long bazaar that started on April 19, 1948. During the early 1950's, Carman grew by leaps and bounds, due primarily to the post-war building boom. In 1950 alone, the district assessed valuation more than doubled, going to $4.5 million. The present 10 horsepower siren was installed and full dress uniforms were purchased for the department. Major fund-raising was accomplished in the early days through carnival sponsorship. The first such event involved the Travis Shows, in 1931, From then until the last carnival, in 1956, many hours were spent at the old carnival grounds on Watt Street. In the 1950's, the Annual Clambake fund raising started and replaced the carnivals as the main financial source for the Department. The Annual Turkey Festival was developed as a supplementary money making affair in the 1970's. Today, the Turkey Raffle mail campaign is the Department's chief fund raising activity. In the early days, much of the money raised by the men of the Department and the Ladies Auxiliary went into a clubroom addition on the rear of the original firehouse building. That structure, which is now used as a training room, was constructed by the members' volunteer labor in 1953. The Town of Rotterdam installed water mains and fire hydrants throughout the fire district in 1953. This resulted in the fire insurance rates dropping considerably. By 1958, the Carman Fire Department had made it through twenty five years of good times and bad times, with many fires but few tragic situations. It even made it through the Twenty Fifth Anniversary celebration that year. 1960 brought some interesting "firsts" to the Carman Fire Department. Chief Bob McGee prevailed on the Board of Fire Commissioners to equip the Department members with the first winter turnout gear (bunker pants, coats and boots) in the Town of Rotterdam. On June 24, 1960 the first and only tornado to come through tore off a corner of the firehouse roof. There was plenty of work to be done by the firemen over the next few weeks after that unusual event. By 1961, the fire district full valuation was $25 million, and E131, our American LaFrance 750 gallon per minute pumper, was delivered. In 1964, the Ward LaFrance 1,000 GPM pumper was added. On December 4, 1964, a Carman Standby was celebrated in honor of the Ice Storm that caused many fallen limbs and trees along with downed power lines. The Firemanic Competition team, affectionately called the "Carman Mud Ducks," was revitalized under the leadership of Assistant Chief Earl King in 1965. That same year, the Carman Fire Department Buff Club was also organized. Where were you when the lights went out? The firefighters of Carman had another stand-by during the famous Northeast Blackout of November 9, 1965. Fortunately, it only lasted for about three hours. Explorer Post 725 came into existence in 1968, with the Carman Fire Department as sponsor. The twenty-five young people who made up the Post represented a valuable resource for the Department. They had given invaluable assistance at fire calls, during search and rescue missions, and with cleanup after return to quarters. Post 725 was presented a National Honor Unit Recognition Award by the Boy Scouts of America in May 1981. The award was bestowed for exemplary honor and bravery, on the part of two of the post members, during a brush fire in our fire district. 1970 was a year that will be remembered for a long time in Rotterdam. The town celebrated its Sesquicentennial, and the Carman Fire Department was prominent in the festivities. Just before the gala 150th Anniversary Parade, the Town's tree and brush dump started smoldering under ground. Carman and the other Rotterdam fire departments spent three days bringing that fire under control. Engine 131, the 1961 American LaFrance, pumped for over 31 hours continuously except to shutdown for fuel and lubrication. Carman did not have enough manpower to join the line of march, but a few tired men did manage to run one of our fire apparatus in the parade. The "Curse of the Chicken" visited Carman for the first time in 1970. On the November meeting night, while the Social Committee was preparing baked chicken, the old abandoned hotel at Chrisler Avenue and Hamburg Street, along side of the bridge, became involved in a major fire. For sometime, it seemed that every time chicken was baked or barbecued at the station, the fire alarm rings. In 1971 the specifications were prepared for the first aerial ladder fire apparatus in Rotterdam. The color selected was DEPTFORD YELLOW, not the traditional RED. Engine 134, the Ward LaFrance, was sent out for re-painting, and in May, a yellow E134 sat in the fire station, the first non-red fire vehicle in Rotterdam. Truck 132, a Maxim Quint 1250 GPM pumper with an 85-foot aerial ladder, arrived in 1972. This vehicle was also the first fire vehicle in Carman to have an automatic transmission with a diesel engine. The Gerstenslager Rescue truck, R 135, was also put in service that year. In short order, the other front line pumper, E 131, was also re-painted yellow. 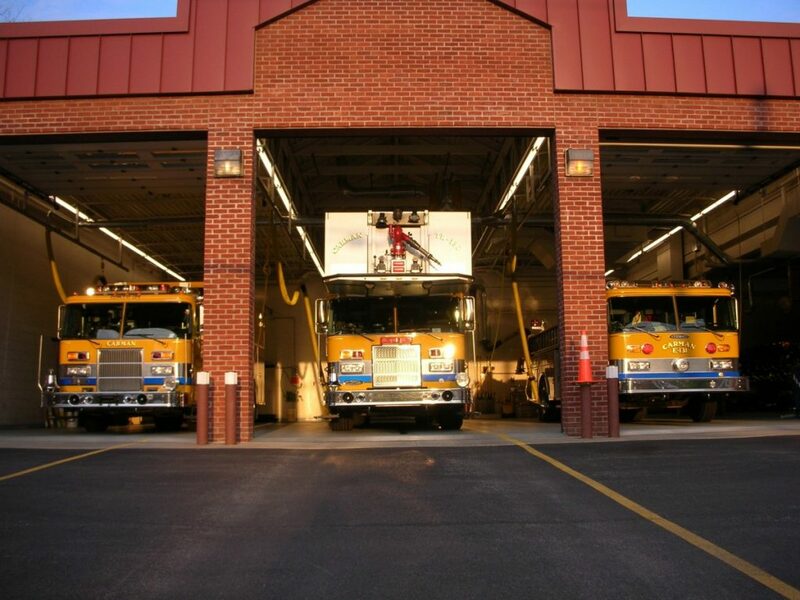 In 1974, an addition to the firehouse apparatus area was started. The intent was to eliminate the two-deep parking used for fire vehicles. The new double bay addition was formally dedicated on May 24, 1975. E 133, a 250 GPM mini-pumper, was delivered by Hamerly in 1977. This vehicle replaced the 1943 Chevrolet grass rig, which became a reserve fire apparatus and competition rig. During 1978, E 131 was re-powered from a gasoline engine to a Diesel power plant. E 134 took a similar route in 1979. An automatic daytime mutual aid response with our three neighboring fire departments was initiated in 1981. That agreement, which was negotiated with Fort Hunter, Rotterdam District No. 2 and Stanford Heights by Chief Victor Fazio, assured the availability of fire apparatus and manpower during the critical daylight hours. In 1983, the Carman Fire Department protected a fire district having a full valuation of ninety nine million dollars. The Department carried a complement of sixty two active members who provided fire prevention, fire extinguishments, and other emergency services. Between 1977 and 1983, the Department responded to 757 alarms involving 10,830 man hours of service on duty. The Carman Fire Department celebrated its Fiftieth Anniversary on May 7, 1983 with an Open House. A gala anniversary parade was held on August 6, with Rotterdam District 2 and Pine Grove Fire Departments, who were also celebrating their fiftieth anniversary. The next day, on August 7, a Firematic Competition was held at the Rotterdam Democratic Club with both Men's and Ladies' Teams entered. Carman's fiftieth celebration culminated on October 8, 1983, with an anniversary banquet held at the Bavarian Chalet Restaurant in Guilderland. 1985 was the start of replacing Carman's fire apparatus inventory. Specifications and bids were prepared for replacing the 1961 and 1964 front line pumpers. Because of the small difference in age of 131 and 134 it was decided to purchase two pumpers at the same time. In June 1986, Carman became the proud parents of twins, delivered on June 19 at 5PM and each weighing in at 38,400 pounds. The two Pierce Arrow fire engines, with 1250 GPM pumps, Detroit Diesel with Allison HT-70 Automatic Transmission and 750-gallon booster tanks, were officially designated as E 131 and E 133. The Rescue vehicle was renumbered R 134 and the mini-pumper was designated as Engine 135. In 1991 another building project added a weight/exercise training room and new Commissioners Office with the old office space used to enlarge the Training/Meeting Room. 1989 was another first for Carman and for the Town of Rotterdam, when the first Fire Chief's Car 139 was purchased and placed into service. 1990 saw a change in Carman's fire apparatus, when, in response to NFPA safety standards, both Pierce Arrow fire engines were returned to the Pierce Manufacturing Plant, one at a time, for enclosing the rear jump seat portion of the cab. This signaled a major change in CFD policy in that firefighters would no longer enjoy that cold winter, invigorating fresh air ride on the rear step. In 1993 and 1994 the other two chief's cars, Car 138 and Car 137, were purchased. Specifications were prepared and bids let for the purchase of a new rescue truck to replace the 1972 Gerstenslager Rescue truck. In 1994 the Pierce Lance Heavy-Duty rescue was received and placed in service as Rescue 134. The pump and compartments were removed from the mini-pumper and placed on a 1995 Ford F450 Heavy-Duty Chassis with a six-passenger crew cab. This revitalized mini-pumper was numbered E 135. A Reading utility body was added to the 1976 Dodge Chassis and the vehicle was redesignated as Utility 136. The next chief car purchases occurred in 1996, when a Ford Explorer was purchased and in 1999 when a Chevy Tahoe replaced the two oldest chief cars. Many changes happened in the fire service in the late 1980's and 1990's. Fire apparatus were getting larger and wider overall and the many rules adopted by the fire service in relation to reporting requirements and firefighter safety caused a shortage of apparatus parking and office space at our firehouse. Upgrades to electrical, heating and plumbing were needed inside our firehouse, which was built in 1948. Ground breaking started in September 1999 on an ambitious $1.5 million addition/renovation project, which added three new apparatus bays, new executive, chiefs, administrative and line officers offices, upstairs hall and rest rooms remodeling, an elevator for second floor access and complete upgrading for electrical, communication and plumbing installations. The largest, most costly piece of fire apparatus was purchased in 2000 to replace the 1972 Maxim Quint. In January 2000, a Pierce Lance 2000 85-Foot Aerial Platform Quint, with 1250 GPM pump and 350-gallon booster tank, was delivered and, after a rigorous training program by department personnel, was placed into service in September 2000. The new building expansion required more emergency electrical power in the event of a power failure, and provisions were incorporated into the electrical design of the building addition to install an automatic start 100-kilowatt house generator that would answer all of the firehouse emergency power requirements. The new emergency house generator was installed and placed in service in August 2002. Over the years, the Department has sponsored a Christmas tree spraying program, 4H Club, a Boy Scout troop, Explorer Post and baby-sitting training courses. Over many years and still today, the Department sponsors two Little League teams and a fire prevention program at area schools. To give an indication of the effort involved in the Fire Department operations, since its inception, would be almost impossible. The time utilized in answering fire calls and rescue operations would not include the countless hours spent with fire inspections, Firemanic and social room duty, fund raising activities, committee meetings, annual inspection cleanup and monthly drills. It would be extremely difficult to accurately determine the total number of man hours of volunteer service that the Firefighters of the Carman Fire Department give willingly for the protection of life and property. It is truly impossible to calculate the value of that service to the people of Fire District No. 3 and the whole Town of Rotterdam.